Format changes - for the better? The UK Championship, the second biggest ranking event of the snooker calendar, begins in York on Tuesday. 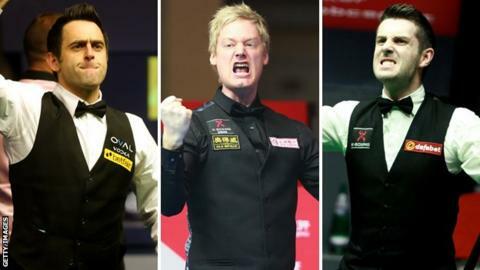 The top players, forced to enter from the beginning of the 128-man event, will come up against some unfamiliar names in the first round before the BBC's live coverage begins with the second round on Saturday. Former world champion and BBC Sport pundit Ken Doherty, who plays world number 89 Mitchell Mann on Thursday, assesses the contenders and possible stories that could emerge at the Barbican Centre. Most of the leading players have won a tournament so far this season. Four-time UK champion Ronnie O'Sullivan managed to retain his Champion of Champions crown in Coventry, while defending UK champion Neil Robertson triumphed at the Wuxi Classic in June. Judd Trump won the Australian Open and Mark Selby, whose wife gave birth to their first child earlier this month, claimed a European Tour event in Latvia. Ding Junhui, winner of five ranking titles last season, continued where he left off by winning the first Asian Tour event. The man going into the tournament in excellent form is Shaun Murphy. The 2008 UK champion made a 147 break in last week's European Tour event in Germany. Remarkably, it was his third attempt at a maximum during the event, having previously failed on the final blue and final green. Ken Doherty's view: You will see the usual suspects in the latter stages. Ronnie O'Sullivan has been in superb form and Shaun Murphy was outstanding in Germany, topping it off with a 147 break. Ding has had a consistent few years and it enjoyed his first major win in the UK in 2005. The public always love watching Judd Trump, he is so exciting. Maybe this tournament might have come too soon for Mark Selby because there is a bit of upheaval when a child is born. When my son came along in 2007, I was at the UK a couple of days later and I was floating on air and very proud to be a new father. It took a bit of focus away from my snooker that week, there is no doubt about it. I ended up going out in the first round against Nigel Bond. On the evidence of O'Sullivan's performances at the Champion of Champions event, he will be the man to beat. Having compiled four centuries in the final against Judd Trump, The Rocket - usually his own harshest critic - stated afterwards, "I think I am playing better than I ever have." An added motivation will be the chance to surpass Stephen Hendry's record of 775 career centuries. O'Sullivan is currently on 764 and could achieve the feat in York. However, his results in the two ranking events he has entered this season were disappointing. A first-round round loss to Alan McManus in the Shanghai Masters was followed by a quarter-final defeat against Mark Williams at the International Championship. Doherty's view: O'Sullivan will be the favourite. The way he has been playing the last couple of years, I think he is getting better with age. He is more of a complete player than he has ever been. He hasn't slowed down on his scoring prowess because his break building is as good as ever. What you are seeing from him now is a more complete package. He doesn't spit the dummy out like he would have done a few years ago and doesn't lose his focus. He is hungrier than he has ever been. The game needs players like him. There is no doubt that he is the man to beat because he sets the barometer for all the other players. Ali Carter competes in his biggest event since making a comeback to the sport after treatment for lung cancer. This season, the 35-year-old won the General Cup title in Hong Kong - his first event since being diagnosed in May - by beating Murphy 7-6 in the final. Carter, who has also overcome testicular cancer, was set to return to action at a European Tour event in Bulgaria in October but was advised to rest after pain in his left arm prevented him from practising. He faces China's Zhang Anda in the first round in York. Doherty's view: It is a fantastic story. Ali has always been a top player and has had his hardships away from the table. He is a brave lad and fought every challenge that has been put in front of him. The cancer was his biggest challenge and it is good to see him back. He is well liked and has the heart of a lion. He will get a great reception from the crowd and that may just inspire him. He had almost six months out and will have been resting after undergoing treatment. He would have got back on the table as soon as he summoned up the strength and that will have taken courage in itself. To do so well in his comeback tournament was remarkable. He will be putting in a lot of work now. The revamped 128-man draw means the top 16 players have lost their protection in ranking events, having previously gone through automatically to the last-32 stage. A further change this year sees the semi-finals reduced from a best-of-17 frames to a best-of-11. "I don't like the changes to the semi-finals," said title holder Robertson. "I thought the best-of 17 was what kept the prestige of the UK Championship, but this is something I don't agree with at all. "It is very unfortunate for the tournament but the better player will win, although as a player you prefer the longer matches, especially in the semi-final and final." Doherty's view: The format is a fair reflection and it needs to be done for a money list where all players play in the same round like in tennis and golf. No matter what system you have, the cream will always rise to the top. I always liked the longer sessions because you get more of a chance to settle into the match. The best-of-11 is still a good match. A lot of the public don't want to wait for two sessions in the first round, they would prefer it to get done and dusted in one session. The top players like Robertson enjoy the longer sessions because there is less likely to be a shock result. But, it is not all about what the players want, it is about what the public and TV people want. They are the ones paying the players' wages, so you have to be happy with it. Banana skins for the big boys? Wells was the first winner of the Paul Hunter Scholarship in 2007, allowing him to practice at Sheffield's World Snooker Academy alongside the likes of Ding. Having first qualified for the main tour in 2008-09, Wells has since dropped off the tour, and lost in the last 16 of Q-School attempting to regain his place. He beat Alfie Burden in the first round of the UK last season, before losing to Joe Perry. O'Connor is a multiple World Masters and European junior champion at pool but has competed in qualifying for snooker's ranking events this season. He claimed the scalp of world number 35 Andrew Higginson in the Wuxi Classic with a 5-0 victory, although he was given a three-frame lead after Higginson arrived late at the venue. Brown caused a huge upset earlier this season, demolishing world number three Ding 5-0 in the Wuxi Classic to earn a place at the final stages of the tournament. Brown "forgot to enter" the fourth European Tour event in Germany, the last one before the UK Championship. The Irishman has a full-time job as a business development manager and is currently under investigation by World Snooker over "unusual betting" in September's International Championship qualifying match against Scot Jamie Burnett. Sutton lost the match 6-0. Doherty's view: All these players are potential banana skins if you don't treat them with the same respect as the top players. A lot of players can make that mistake. These guys have the ability to beat anybody so you have to be wary. There are no easy games anymore, like a few years ago. I certainly won't be taking my opponent Mitchell Mann lightly. This is a big tournament and the last thing you want to do is go out in the first round. It is a great opportunity for the younger guys with there being so many tournaments and they are getting so much more experience. They can now play on TV in the first round and that is invaluable experience for them. It will give the younger players a chance to break through much quicker. The UK always throws up some great matches. It will be fascinating to see how it pans out.